Leaning Art vs. Hanging Art: Which is Right for Your Space? Chances are, you've probably designed, arranged and curated the perfect gallery wall. Getting it just right is the icing on the cake when it comes to putting the finishing touch on any well-decorated room. One of the best elements of a perfect gallery wall is that there's so much creativity and individuality involved—artwork can help you express yourself and your personality in your home, no matter the room. These days, however, leaning art is becoming just as popular as the good old hammer-and-nail method of hanging it. 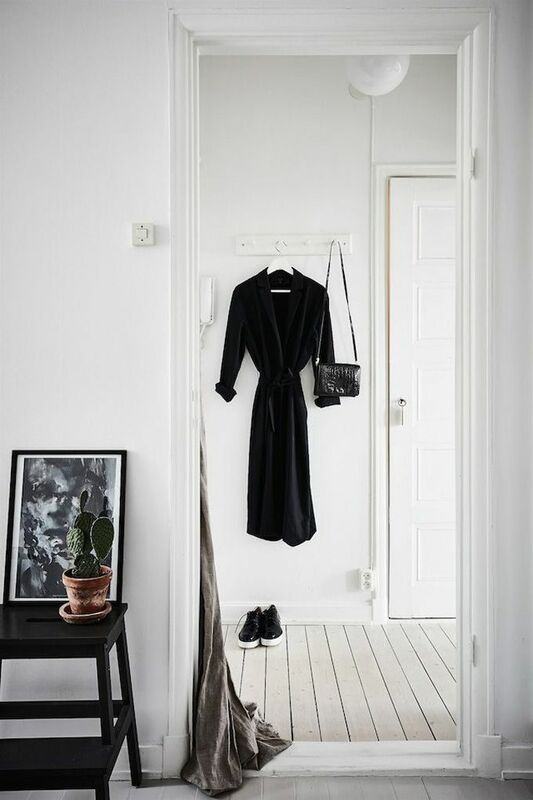 This space from My Scandinavian Home proves just how effortless a piece of art can look when it's not hung, but leaned—but is it right approach for you and your home? Here are the pros and cons of both methods. One of the biggest pros of leaning art is the ability to go wild with creativity. You can layer larger pieces with smaller pieces—or, as seen in this setting from Coco Lapine Design, add a totally empty frame to make the look pop. Layering artwork helps to give your selectios even more depth and dimension, and can add oodles of visual interest to any space. It instantly transforms a simple bookcase, like this one, into an installation piece. Designers and home decorators alike have been hanging art for centuries—and there's a good reason for that. If you have a lot of pieces of art, leaning them can look disorderly and hapazard, but hung art creates a sense of order with clean, precise lines. Especially if you're displaying a lot of similarlly-sized artwork, like blogger Ivory Lane did in this room, hanging it can help make it appear even more neat and organized. When deciding between hanging art and leaning it, consider the impression you want to give off. Are you into a bohemian look or do you want to stay a little more traditional? We love this simple display of artwork from Nicole Franzen, but it works so well because the room has a wonderful surface—a fireplace mantle. This leaning art fits perfectly with the rest of the room. It adds a little bit of fun to the space and lends personality, so it doesn't end up feeling staged or artificial. But consider this: If the fireplace wasn't there, it would be harder to find the right place to lean a piece of artwork. Consider your surfaces when deciding how to display your art—though we think leaning artwork on the floor can look beautiful, it may not work for every home. If you struggle with commitment, the idea hammering into your wall to display art you may not like in six months can be daunting. Though we love this gallery wall from _lisa_dawson , it's not easy to switch up when those selections get old. Though you can use renter-friendly tricks such as Command strips, it's a lot harder to move around a mistake when it is leaning than it is when it's firmly attached to your wall. Consider whether you have decorating ADD before you put a large hole in your wall. When you're decorating a small space, any hint of personality and visual intrigue can help take your mind off of the limited square footage. This quaint space seen on Lonny is dripping with style, and the gorgeous leaning artwork is easily the room's focal point—making it appear larger than it actually is. If you have a uniquely-proportioned room or you're struggling with a space that just doesn't feel quite finished, leaning a few statement pieces can solve your design woes. When you lean art, you have to consider not only the surfaces you lean it on, but whether the artwork itself can even be hung at all. This entryway from This Mamas Dance proves that a gallery wall doesn't have to contain only standard rectangle frames, and mixing up the mediums is a lot easier when you don't have to consider whether they will stand up. Whether you want to experiment with hanging baskets or you want to display a few vintage trinkets, a wall can be the perfect canvas. If you have a mantle or a few shelves to lean your art on, you can more easily fill a blank wall. But if you're working with only a single surface, like in this bedroom from Morrone Interiors, you may find the art doesn't fill the space as much as you'd like. Consider how much wall space you have available and whether you'd like to add more art than your surfaces allow. But if you do want to keep things simple, bare walls can look chic and minimalist as long as you focus on clean lines throughout the room. This chic gallery wall from Pretty Providence works because the art itself is visually interesting and eye-catching. But if you don't own such bright and engaging pieces of art, leaning it can be a better way to add the interest the imagery itself lacks. When you hang your art, you can't experiement with layering and other methods of adding a sense of dimension. Though you can mix in a few different elements to give the look more oomph, it's not as simple as layering your pieces. It's clear that this room from scandinavianhomes has a theme—and it works. The abstract art creates a modern feel in the living space, and it works incredibly well with the minimalist furniture. But let's say the owner bought all new furniture and wanted to change the overall feel of the space. With leaning art, you can transform the look of a room in an afternoon. Want to add some holiday cheer to your living space? Throw in a few framed Christmas photos and voilà! This gallery wall spotted on Hurd & Honey packs a punch, but it wasn't thrown together on a whim. Hung art can look professional and purposeful, but it takes a lot more planning. To create the botanical theme of this room, the designer had to carefully select each piece of art and measure it to make sure it fit perfectly within the space. Though the result is oh-so-worth-it, consider the time it takes to plan out a truly showstopping hanging gallery wall when considering whether to grab that hammer.